In 2016 the General Assembly passed House Joint Resolution 7, which directed JLARC staff to review various aspects of the Virginia Economic Development Partnership Authority (VEDP), including its operational efficiency, performance, and accountability structure. JLARC staff were also directed to review the level of coordination of economic development programs in Virginia. The General Assembly established VEDP in 1995 to “encourage, stimulate and support the development and expansion of the economy of the Commonwealth through economic development.” VEDP has sought to accomplish this statutory objective primarily through marketing Virginia as a good place to do business, promoting international exports, and administering economic development incentive grants. VEDP is almost entirely funded by state general funds and is governed by a board of directors. VEDP lacks many of the fundamental components of organizational management needed to operate efficiently and effectively and to coordinate well with external entities. Key elements missing from VEDP’s operations include a deliberate strategy to meet its statutory responsibilities, adequate operational guidance for staff to carry out their job responsibilities, effective accountability mechanisms, useful performance measures, reliable data upon which to evaluate performance, and effective coordination with external partners. Without these elements, VEDP risks wasting limited resources and failing to meet its statutory requirements. VEDP has not taken basic steps to ensure it is effectively and efficiently marketing Virginia to new and existing businesses. 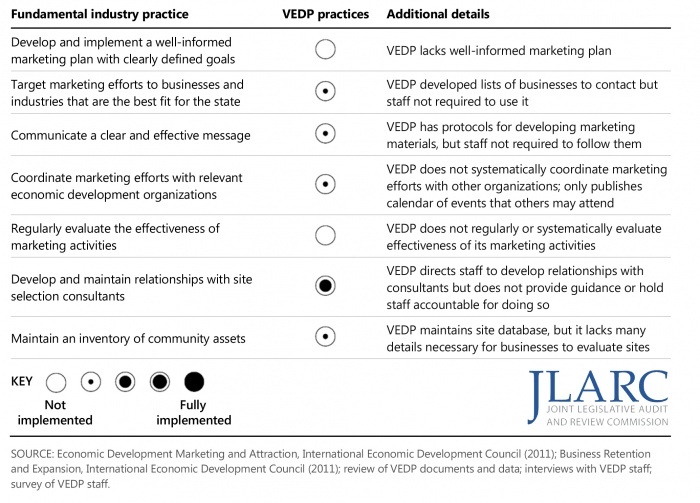 Despite having the statutory responsibility to “see that there are prepared and carried out effective economic development marketing and promotional programs,” VEDP has done little in the way of systematically planning, controlling, or evaluating its marketing activities, and it has not followed fundamental practices for effective economic development marketing. As a result, VEDP’s marketing services have been largely reactive and have generated substantially fewer location and expansion decisions (“announcements”) than suggested by the agency’s performance measures. VEDP’s export promotion (international trade) programs have demonstrated success in assisting Virginia companies with selling their products in international markets. VEDP’s programs aimed at promoting growth in international exports largely follow fundamental industry practices, are held in high regard by stakeholders and staff at VEDP-equivalent organizations in other states, and have demonstrated positive results. Still, VEDP could improve its practices by collecting additional information to evaluate its performance and by ensuring international marketing and export promotion efforts are well coordinated. VEDP’s approach to administering incentive grants has exposed the state to avoidable risk of fraud and financial loss, and has increased the potential that state grant funding is not efficiently allocated. VEDP administers 10 incentive grant programs and awarded $384 million to companies over the past decade. During this time period, many of the projects supported through VEDP-administered incentive programs did not meet their performance requirements—highlighting the importance of having an effective incentives administration function. 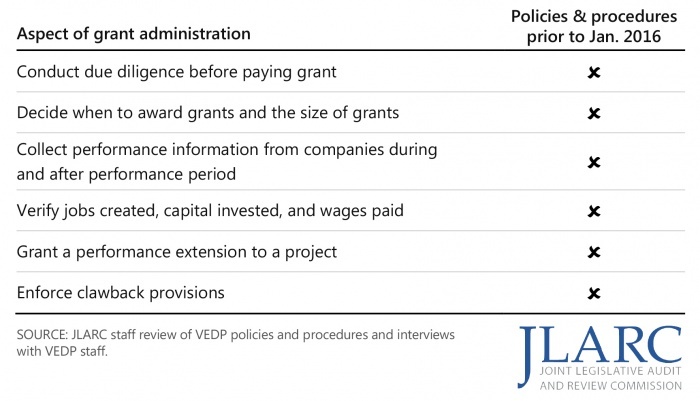 VEDP’s lack of comprehensive written policies and procedures for critical aspects of incentives administration calls for a more structured, formalized, and transparent approach to awarding incentives, monitoring and verifying grant recipient performance, and ensuring compliance with contract provisions. VEDP needs new policies and procedures to ensure that it prioritizes projects that create quality jobs and have the greatest economic benefit for Virginia’s regions. State, regional, and local economic development entities in Virginia operate mostly independently of one another and do not systematically coordinate their activities and spending—limiting their ability to share best practices, align activities, and leverage the resources of others. Coordination that does occur is generally unstructured, reactive, and limited to specific projects or one-time events. This lack of coordination appears to be noticed by site selection consultants, professionals who are hired by businesses for their expertise in finding desirable locations to relocate or expand business operations. Several barriers have limited the state’s ability to coordinate economic development efforts. Barriers include the lack of an agreed-upon definition of what constitutes an economic development program or activity, distrust between state, regional, and local entities, a lack of common goals around which to coordinate, and no accountability mechanisms to ensure coordination. The systemic deficiencies at VEDP present significant challenges to the organization’s ability to operate efficiently and effectively, and to be held accountable for doing so. Although the board of directors has recently begun to address issues of inadequate engagement and a misunderstanding about their governing responsibilities, the board will still find it difficult to hold VEDP accountable without adequate expertise and sufficient and reliable information about the agency’s operations and performance. Require the VEDP board of directors to develop and regularly update a strategic plan for VEDP. Direct the VEDP board of directors to ensure that VEDP executes its statutory responsibilities efficiently and effectively. Make any additional VEDP appropriations contingent on implementation of report recommendations. Establish a statewide entity to improve systematic coordination across state’s economic development programs. Establish and enforce penalties for staff when they do not comply with agency policies or statutory provisions. Develop and adhere to a written annual marketing plan. Develop and adhere to comprehensive policies and procedures for incentive administration to reduce state’s exposure to risk of fraud, financial loss, and poor use of limited resources. Hire full-time and fully qualified staff solely responsible for incentive administration. Establish an internal audit division that reports directly to the VEDP board of directors. The complete list of recommendations is available here. Copyright 2019 Joint Legislative Audit and Review Commission. All rights reserved.